When we consider living and working today, it’s important to remember that our worldwide neighbors are closer than ever before. Next September, RIT will take another step toward bringing our international influences closer to campus with the grand opening of Global Village, a retail marketplace and housing complex that will bear a resemblance to the street-side cafés of Europe. But know this: RIT isn’t investing solely in European ambiance. University leaders are hoping this initiative will propel RIT students to a new level of global preparedness as they take their knowledge overseas and enter a culturally diverse workforce. 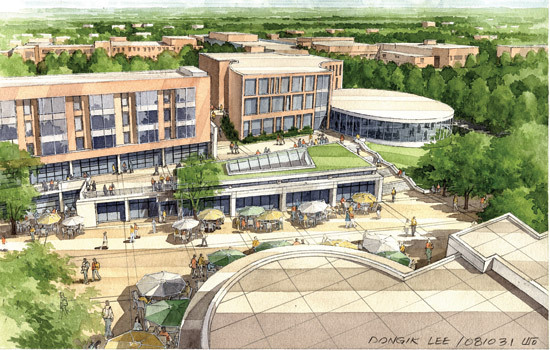 Global Village, a $54.5 million campus centerpiece, will be situated between Crossroads and the campus’ new Student Services Building near the Center for Student Innovation. It will be home to cultural residences representing regions from around the world —East Asia, the Middle East, Central Europe and Central America— and will have 414 beds for upper-class students. “As we reflect upon RIT’s strategic plan, only one word was added to our vision statement—global,” says James Watters, senior vice president for finance and administration. “In order for our students to be successful in this global society, it is necessary to provide them with global experience and global study. This campus enhancement was created for that reason.” The RIT administration has created ambitious goals for its international study-abroad program. The new objective set by RIT President Bill Destler is to have more than 350 students participate in international co-ops each year. University goals include a much better international integration for the execution of RIT’s key strategies. “Global Village will give our study-abroad office the opportunities to connect right away with students interested in international travel and study,” says Tynelle Stewart, director of RIT’s study-abroad program. “We will help them prepare in every way—including helping with financial preparations and familiarizing them with the language and culture before they travel. But, just as important, we will be their connection when they return to RIT with a re-entry program to help manage reverse culture shock and help them bring what they’ve learned overseas back to campus and into the working world. Global Village will certainly be the hub of these supportive activities and we hope to extend our efforts in this new location.” The study-abroad program is in the midst of developing a pilot program in the Colby residence hall with Housing Operations to provide these services. The housing component for this project will replace the aging and outdated Riverknoll apartment complex. “Riverknoll is among the oldest residential areas on campus,” says Watters. “It is a priority that we replace this unit. But, it’s also important to note that this refurbishment is not a burden on the tuition of the students and it will not diminish the resources that are important to our students. This is absolutely the right time to build this amazing complex.” Global Village housing is characterized as customized suites that will be designed and outfitted with items from around the world. Resident advisors from regions across the globe will be in the units to help with language-barrier issues and to provide students with information and guidance as they are immersed in their new global environments. RIT’s Foreign Language Lab will also be housed in this location for added student support. “I’m excited about the creation of Global Village because it will provide our campus housing program with new concept housing options that will enhance our students’ social and educational network opportunities,” says Howard Ward, assistant vice president for Student Auxiliary Services. “The total Global Village experience will give our students a competitive edge in the new world market if they take advantage of all that we have to offer. “Over the past 12 years, RIT has spent $170 million on student housing,” adds Ward. “When Global Village opens, RIT will house 7,400 students in university-owned housing. This housing base and the amount of investment clearly has repositioned our competitive edge regarding student housing, and RIT will house about 80 percent of our undergraduate population. This is where we should be from a competitive standpoint.” Several campus groups have been and will continue to be involved in the ongoing planning for the project. Focus groups were formed and administrators have asked for interdepartmental cooperation in order to embrace the Global Village concept. And, of course, RIT students play a vital role in the project planning. “The biggest impact that Global Village will have on the students is opening up the opportunity for more students to reside on campus,” says Jacqueline Robinson, RIT student government vice president. “Global Village will provide more housing opportunities which will play a large role in student satisfaction.” Global Village will also boast unique retail space including a Mexican cantina with outdoor terrace, post office, wellness center, art store, convenience store, fitness studio and bank. Signature components of the project include an ice rink for winter fun, outdoor fireplace, European-inspired courtyard and a performance area. There are also plans to incorporate the ‘old and the new’ into the Global Village design by using salvaged antique cast-iron pieces from RIT’s former downtown Rochester campus in the creation of new railings and seating areas. James Yarrington, RIT’s director of campus planning and design, is overseeing the development of Global Village. “We’ve done our research and we know the kind of environment that we want to provide for our students,” says Yarrington. “Everything from the decorative, yet subtle, lighting to where we place seating for maximum enjoyment as the sun rises and sets has been taken into account. “Global Village isn’t just another interesting spot on campus. This space will be more active, more colorful—there will be lots to experience and it will function as a major crossroads of this campus. Global Village creates the public space that symbolizes the role it plays on this campus.” Yarrington emphasizes that Global Village is creating opportunities for sustainability. There are plans for this project to be LEED certified—an internationally recognized green building-certification system, providing third-party verification that a building or complex was designed and built using strategies aimed at improving performance across all the metrics that matter most—energy savings, water efficiency, carbon dioxide emissions reduction, improved indoor environmental quality and stewardship of resources and sensitivity to their impacts. Global Village is moving along according to plan. The site is under development and visitors will soon see foundations and steel erections. And shortly thereafter, the community will begin to see the project take shape. Adds Yarrington: “In a word, Global Village will have a ‘soul.’” For more information about Global Village, including project updates and photos, visit finweb.rit.edu/housing/futurehousing.html. Cost: $54.5 million Project size: Phase I — 188,300 gross square feet Timeline: Completion set for next fall Number of beds: 414 Retail space: Approx. 24,000 square feet of commercial and retail space Restaurant details: One full-service restaurant and bar, and two themed dining venues Interesting fact: The courtyard building is one story higher on the courtyard side (east and south elevations). This accounts for the slope between the grade at Crossroads and the grade at Greek housing which is on a hill.